Dear brothers and sisters, good morning and happy new year to all! Today, eight days after Christmas, we celebrate the Holy Mother of God. Like the shepherds of Bethlehem, we stand with our eyes fixed on her and on the Child she holds in her arms. And in this way, showing us Jesus, the Savior of the world, she, the mother, blesses us. Today Our Lady blesses us all, everyone. He blesses the path of every man and every woman in this year that begins, and that will be good just as each one has received the goodness of God that Jesus came to bring into the world. In fact, it is God's blessing that gives substance to all the good wishes that are exchanged these days. And today the liturgy reports the ancient blessing with which the Israelite priests blessed the people. Let us listen well, say: "May the Lord bless you and keep you. May the Lord make his face shine and give you grace. May the Lord direct his face to you and grant you peace "(Nm 6,24-26). This is the ancient blessing. Three times the priest repeated the name of God, "Lord", stretching out his hands to the gathered people. In fact, in the Bible, the name represents the very reality that is invoked, and so, "placing the name" of the Lord on a person, a family, a community means offering them the beneficial force that flows from Him. In this same formula, twice the name of the "face", the face of the Lord. The priest prays that God "let him shine" and "turn him" to his people, and thus grant him mercy and peace. We know that according to the Scriptures the face of God is inaccessible to man: no one can see God and remain alive. This expresses the transcendence of God, the infinite greatness of his glory. But the glory of God is all Love, and therefore, while remaining inaccessible, like a Sun that can not be looked at, it radiates its grace on every creature and, in a special way, on men and women, in which it is most reflected. "When the fullness of time came" (Gal 4: 4), God revealed himself in the face of a man, Jesus, "born of a woman". And here we return to the icon of today's feast, from which we started: the icon of the Holy Mother of God, who shows us the Son, Jesus Christ, Savior of the world. He is the Blessing for every person and for the whole human family. He, Jesus, is a source of grace, mercy and peace. This is why the holy Pope Paul VI wanted the first of January to be the World Day of Peace; and today we celebrate the fifty-second, which has as its theme: Good politics is at the service of peace. We do not think that politics is reserved only for rulers: we are all responsible for the life of the "city", of the common good; and politics too is good to the extent that each one plays his part in the service of peace. May the Holy Mother of God help us in this daily commitment. I would like everyone to greet her now, saying three times: "Holy Mother of God". Together: "Holy Mother of God", "Holy Mother of God", "Holy Mother of God". 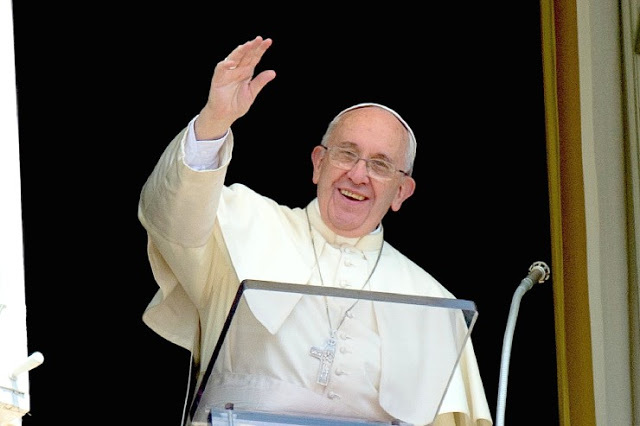 on Christmas Day I addressed a message of fraternity to Rome and to the world. Today I renew it as a wish for peace and prosperity. And we pray every day for peace. I thank the President of the Italian Republic for the greetings he addressed to me last night. The Lord always blesses his high and precious service to the Italian people. My cordial greetings go especially to you, dear Romans and pilgrims who are here today in Piazza San Pietro, so numerous! It looks like a canonization, this! I greet the participants in the "Peace in all lands" event, organized by the Community of Sant'Egidio. And here I want to express my appreciation and my closeness to the countless initiatives of prayer and commitment for peace that are held in this day in every part of the world, promoted by the ecclesial communities; I remember in particular that which took place yesterday evening in Matera. Through the intercession of the Virgin Mary, the Lord allows us to be artisans of peace - and this begins at home, in the family: artisans of peace - every day of the new year. And I wish you, another time, a good and holy year. Please do not forget to pray for me. Good lunch and goodbye.